It prevents cavity and maintains oral hygiene. It fight against oral germs. It makes teeth strong and brings shininess. Patanjali Dant Kanti Dental Cream is a unique blend of herbal ingredients that give a refreshing feeling and it helps to maintain oral hygiene. It enriched with healing properties which is beneficial for curing bad breath, hot/cold sensitive gingivitis, toothache, spongy bleeding gums and several other oral ailments. It is a perfect option for regular use. It is used to maintain oral hygiene. 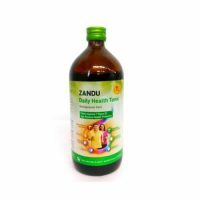 It improve oral health with Dant Kanti¢s which is made up of time-tested herbal ingredients. It offer dental protection & improve dental beauty. Dant Kanti works to guard and beautify teeth. Packed with the goodness of natural ingredients. Dant Kanti dental cream offers healthy health in a variety of ways. It diminish Dental problems such as pyria, gingivitis, and bad odour when used every day. Name of various ingredients: Neem, Laung (Cloves), Babool, Pudina, Haldi( Turmeric), Majuphal, Pippal (Pipli) Chotti, etc. Babool : It protect the gums. Neem, timbaru, turmeric and cloves : These all remove bad breath and offer protection from bacteria. Pudina and Pipli : It refresh the gums. Peelu and Maju phal : It make gums stronger. It prevents cavity and maintains oral hygiene. It fight against oral germs. It makes teeth strong and brings shininess. Direction to use: Take peanut size Patanjali Dant Kanti Dental Cream twice a day . Shelf Life: It is best before 18 months from the date of manufacturing. Caution: It is not recommend to children below 7 years. Storage condition : Store in a cool place. Keep away from direct sunlight.